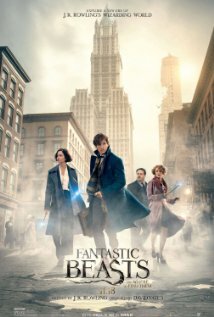 All you Harry Potter fans have probably been waiting for some magical movie to come out and finally it is here. Although Fantastic Beasts and Where To Find Them is in the Harry Potter universe, it is all based in the past over 70 years ago. Sadly, you will not see the likes of Harry Potter and friends this time. You will get to hear of one person through this film who is in the Harry Ptter franchise and a couple of mentions of Hogwarts, but that's about it. Even so, this flick is so worth your time. I will not say Fantastic Beasts out does Harry Potter, but it was great seeing the magic unfold on the big screen again. In this story, we are in 1920's New York. We follow Newt Scamander (Eddie Redmayne), a wizard who collects magical beasts and is planning on writing a book about them, so the world of magic can know about the beasts and treat each one with respect, rather than fearing and killing the innocent creatures. He encounters Jacob Kowalski (Dan Fogler) a "No-Maj" or America's version of "Muggle" -- a human with no magical abilities. Jacob somehow swaps briefcases with Newt and some beasts escape out in New York and that's when the adventure begins. Unlike some muggles in Harry Potter, Jacob was funny and mesmerized with this new world and enjoys being a part of it. Along the way, we meet up with a detective in the magical world by the name of Tina (Katherine Waterston) and her sister Queenie (Alison Sudol). Together, they go out in New York and try to round up the escaped beasts..
You will also get to meet a new villain by the name of Graves (Colin Farrell) and a new evil being, but what I liked most of all is that the magical beasts introduced were really awesome. There were creatures in Harry Potter but this movie brought out a lot more and ones that you wish were real. Some were huge and some were small and most of all they each had something special about them and that's why Newt wants to protect them and write his book. Fantastic Beasts and Where To Find Them was an adventure from start to finish and I'm sure you don't want to miss out on the magic, so check it out.